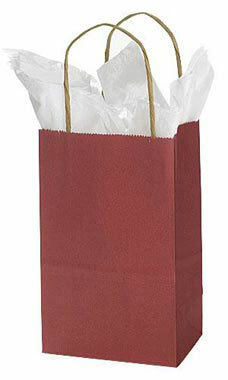 Stop customers in their tracks when they see the small Brick Red Paper Shopping Bags from Store Supply Warehouse. Pair it up with our retail packaging accessories to transform our colored paper shopping bags into beautiful gift bags. Each paper bag features twisted rope handles, which provide a convenient way for customers to take home their purchases. Complete with a gusset and tear-resistant construction, these durable bags can fold up at check out for easy storage. Sold in cases of 100.